The Richmond District hosted the Army in 1898. In the first battle of what became known as the Spanish-American War, Commodore George Dewey's naval squadron destroyed seven Spanish ships in Manila Bay on May 1, 1898. The War Department had expected the conflict with Spain to be fought primarily on the seas, and Dewey's win boded well for American success. President McKinley quickly used Dewey's triumph to shift the focus of the war away from Cuba and instead onto Spain's rich colonies in the Pacific. Naval war or not, McKinley called for the Army to recruit a total of 125,000 men, and directed forces to be marshaled in San Francisco for deployment to the Philippine archipelago. 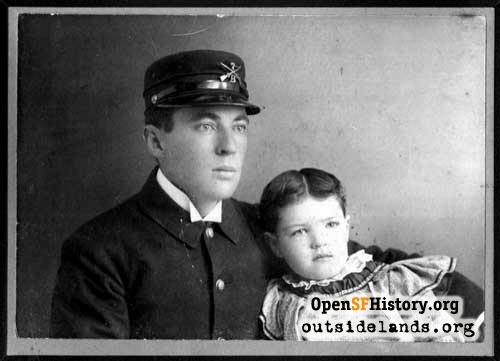 By early May 1898, trains began arriving in Oakland with young men from Pennsylvania and Colorado, Oregon and Kansas---all coming to form a 20,000-man expeditionary force headed by General Wesley Merritt. Welcoming parties of the Red Cross Society met the units at the San Francisco Ferry Building with food and flowers. The mostly-volunteer infantries, feted and cheered along the way, would then march up Market Street to their campsites. 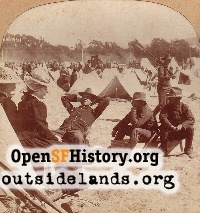 Early arrivers, such as the 6th California Infantry and 1st Washington Infantry, bivouacked on the eastern boundary of the Presidio of San Francisco army base. While the Presidio had ample open space, it had a limited water supply. 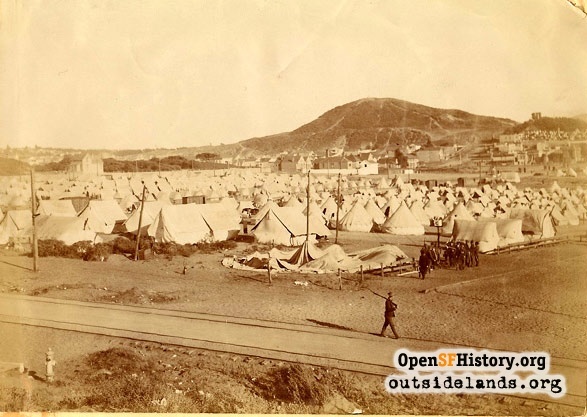 The Army worried about sanitation issues with thousands more men on the way, and other encampment sites were sought for the troops due to arrive from eastern states. The Crocker Estate Company offered the government use of the defunct Bay District Race Track land, situated between the Presidio and Golden Gate Park. The site had enough space for 10,000 troops, with nearby city water mains available. 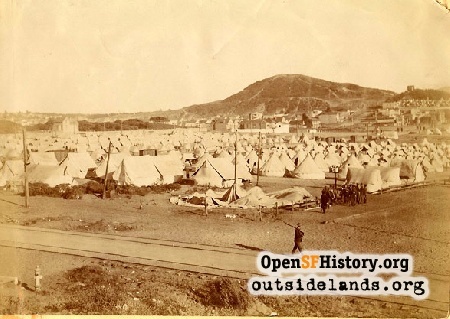 The Army gratefully accepted, and starting on May 18, 1898 rows of white tents lined the sandy lots between today's Geary Boulevard, Fulton Street, Arguello Street and Sixth Avenue. An eventful summer for the Richmond district was about to begin. 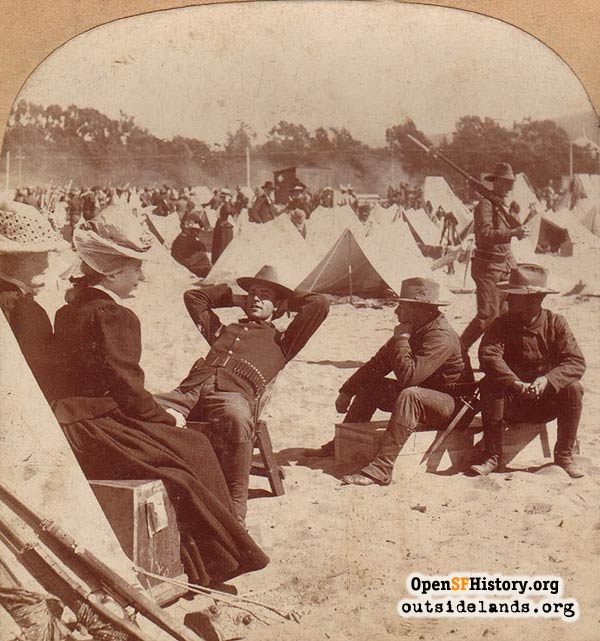 Initially called "Camp Richmond" or "Bay District Camp" the growing encampment received the official name "Camp Merritt". Despite this honor, the eponymous commanding officer was rarely seen in the area. General Merritt roomed downtown at the Palace Hotel, and when he left his suite it was usually for soirees, parties, and balls in the city or down the peninsula at the estates of the wealthy. 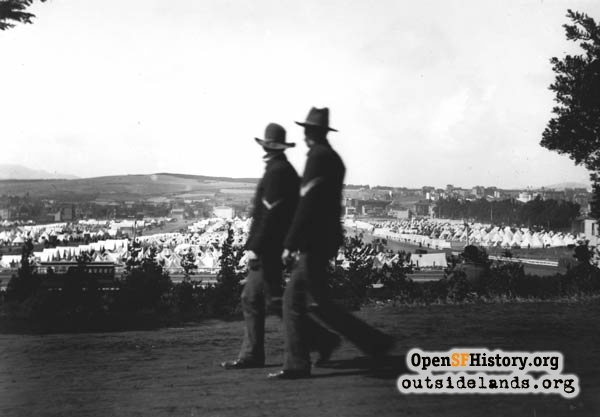 With all of San Francisco abuzz over the war preparations and the city's role as jumping-off point, General Merritt and other officers found themselves with full social schedules attending the multitude of celebratory send-offs. The enlisted men and volunteers also received their share of attention in the Richmond district. As the number of soldiers in the Richmond approached 7,000, a camp extension had to be created on James Clark Jordan's adjacent land, today's Jordan Park neighborhood. On May 28, 1898 the division hospital moved to this section, and eventually troops from Montana, North Dakota, South Dakota, and Iowa would camp on these blocks between today's Geary Boulevard, California street, Palm and Commonwealth avenues. Developer Fernando Nelson began filling in the Bay District Race Track site with homes in 1902. The sand that once blew into the coffee of irritated soldiers was buried under concrete, blacktop, and row housing. Fifty-four years later, the plaque has disappeared from the building. Camp Merritt, and the Richmond district's small role in a long war, is now commemorated by a faint rectangle and four bolt holes. Update: The plaque was found and remounted to the building in late 2008. Thanks to the owners of 695 Second Avenue for finding it! Read diary entries from a soldier of the time on this very nicely-done site by John Asendorf. 2. Richmond Banner, June 10, 1898, Vol. 4, No. 40, pg. 3, col. 2 and June 3, 1898, Vol. 4, No. 39, pg. 3, col. 1. 3. "Police Commissioners Call a Halt on Increase of Saloons at Camp Merritt", San Francisco Chronicle, June 9, 1898, pg. 3, col. 2. 4. Richmond Banner, July 15, 1898, Vol. 4, No. 41, pg. 3, col. 2. 5. Allen L. McDonald, The Historical Record of the First Tennessee Infantry, no date, pg. 5, and J.I. Markey, From Iowa to the Philippines, A History of Company M, Fifty-First Iowa Infantry Volunteers, Red Oak, Iowa, 1900, pgs. 108-116. 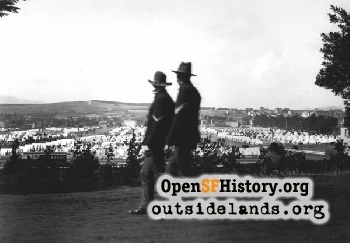 A great synopsis of troop attitudes on Camp Merritt is in chapter ten of Erwin N. Thompson, Defender of the Gate, The Presidio of San Francisco, A History from 1846 to 1995, National Park Service, Denver Service Center, July 1997. 6. Letter from Major General E.S. Otis to Col. Charles Denby, 19 November 1898. 7. Richmond Banner, July 29, 1898, Vol. 4, No. 47, col. 2. 8. Richmond Banner, August 12, 1898, Vol. 4, No. 49, pg. 3, col. 1. 10. "7 Old Soldiers Recall Sand-Dune Camp in '98", San Francisco News, May 23, 1952, pg. 30, col. 2. Page launched 25 November 2006.